The Schottky diode or Schottky Barrier Diode unlike the semiconductor diode that has a P-N juntion, has an N-Metal junction. These diodes are characterized by their switching speed and low voltage drop when they are forward biased (typically 0.25 to 0.4 volts). Its symbol is showed on the following diagram. 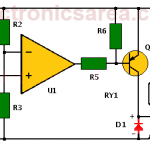 This diode works allmost like the ideal diode unlike the common semiconductor diode. However, it has some features that make it impossible to use in power applications. 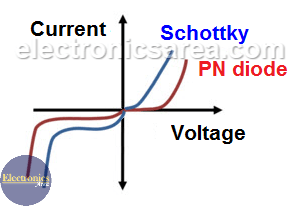 The common P-N diode has its curve in red and the Schottky diode has its curve in blue. It can be seen from the diagram that the Schottky diode has a lower voltage drop than that of the PN diode, when it is forward biased. It is also observed that the same happens when the diodes are reverse biased. 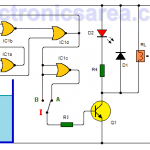 It has a small current flow capacity when it is forward biased (the current flows in direction of the arrow of the diode). So this diode can not be used as a rectifier diode. There are rectification processes (eg power supplies) where the amount of current that the diode must conduct is quite large. It does not withstand large voltages when it is reverse biased (VCRR). However it has a large number of applications in high-speed circuits like computers circuits where high speeds are needed for switching. Also, when it is forward biased has a low voltage drop causing small energy comsumption. The Schottky diode is named after the German physicist Walter H. Schottky.